Nelipak Healthcare Packaging has been named by Medical Design & Outsourcing as their “Leadership in Medtech 2018” winner in the “Product Development” category. A key component of Nelipak’s global success in packaging product development is the company’s 100% healthcare-focused design and engineering teams, who customize and optimize medical and pharmaceutical packaging to meet the stringent needs of every customer. Nelipak’s designers apply their expertise to the development of solutions that deliver on performance, functionality, and product protection. The designers use CAD/CAM systems and sketch tablets to visualize the sequence of use in storyboards. As a true packaging partner, our designers involve the customer in every step of the process, from inception to completion. Click here for more information about the design and development services that Nelipak provides. Cranston, RI, (November 27, 2018) Nelipak® Healthcare Packaging (“Nelipak”), a full-service global provider of custom thermoformed packaging that provides superior protection for medical devices and pharmaceuticals, has unveiled significant enhancements to its manufacturing facility in Humacao, Puerto Rico which will result in greater manufacturing capabilities and approximately 65 jobs. Renovations included the addition of a new control room and a Class 8 Cleanroom at the 67,250 square feet location in Humacao Industrial Park. Headquartered in Cranston, RI, Nelipak has eight healthcare packaging facilities around the world and employs approximately 750 people in the United States, Netherlands, Ireland and Costa Rica. In Puerto Rico, there are presently approximately 65 workers, with the company committed to maintaining a strong presence there in support of its customers. “Nelipak’s new enhancements in Humacao will create jobs specific to the thermoformed healthcare packaging industry. The generation of employment opportunities for our work force represents new hope to continue our path to the economic development of Puerto Rico,” Manuel A. Laboy Rivera, secretary of Commerce and Economic Development (DDEC). Nelipak recently hosted an open house for invited delegates to tour the renovated facility and see the latest enhancements to Nelipak’s packaging capabilities. With facilities in Cranston, RI; Phoenix, AZ: Whitehall, PA; Liberty, NC; Venray, the Netherlands; Galway, Ireland; Humacao, Puerto Rico; and San Jose, Costa Rica, Nelipak® Healthcare Packaging designs, develops and manufactures custom thermoformed packaging products that provide superior protection for medical devices and pharmaceuticals. The company offers medical trays and blisters, surgical procedure trays, pharmaceutical handling trays, custom built sealing machines and other value-added services. Nelipak’s customers consist of some of the largest and most reputable medical device and pharmaceutical companies in the world. Nelipak is focused on delivering superior quality and customer experience through world class manufacturing at each of its locations. More information about Nelipak can be found at www.nelipak.com. Nelipak® Healthcare Packaging is a trade name of Nelipak® Corporation. WHO: Nelipak® Healthcare Packaging (“Nelipak”), a full-service global provider of custom thermoformed packaging that provides superior protection for medical devices and pharmaceuticals. WHAT: At COMPAMED, Nelipak will be in Hall 8B / J17 showcasing how its in-house design, development and manufacturing capabilities can be applied to today’s packaging challenges to create optimized custom solutions that are ideal for even the most stringent healthcare environments. The company will also be featuring its custom-built sealing machines for medical device and pharmaceutical thermoformed blisters and trays. Additionally, the Nelipak team will be available to discuss how volume studies provide a clear understanding of the loading factor for product shipping from the thermoformer to the OEM, leading to potential reduction in shipping loads. For a briefing contact Sage Morander at sage.morander@svmpr.com. WHEN: COMPAMED will take place from November 12-15, 2018. With facilities in Cranston, RI; Phoenix, AZ: Whitehall, PA; Liberty, NC; Venray, the Netherlands; Galway, Ireland; Juncos & Humacao, Puerto Rico; and Heredia, Costa Rica, Nelipak® Healthcare Packaging designs, develops and manufactures custom thermoformed packaging products that provide superior protection for medical devices and pharmaceuticals. The company offers medical trays and blisters, surgical procedure trays, pharmaceutical handling trays, custom built sealing machines and other value added services. Nelipak’s customers consist of some of the largest and most reputable medical device and pharmaceutical companies in the world. Nelipak is focused on delivering superior quality and customer experience through world class manufacturing at each of its locations. More information about Nelipak can be found at www.nelipak.com. Nelipak’s Director of Strategic Sales for UK & Asia Pacific, Angela Shotton, has been invited by the NVC Netherlands Packaging Centre to participate on the jury for this year’s prestigious De Gouden Noot, the world’s most competitive packaging innovation contest. De Gouden Noot stimulates ‘holistic’ innovations in packaging and packaged products. Each entry is judged rigorously on its over-all level of innovation. The first of two jury rounds will take place Thursday, June 28th and Friday, June 29th, followed by a second round of judging on October 17th. The Award Ceremony will take place in conjunction with the Annual Meeting of Members at the A’DAM Tower in Amsterdam on November 22, 2018. Winning the contest brings a wealth of international publicity and acknowledges the work put in to the packaging. Visit www.degoudennoot.com for more information. BOSTON, MA – June 4, 2018 – EY today announced that Mike Kelly, president and CEO of Nelipak® Healthcare Packaging (“Nelipak”), a full-service global provider of custom thermoformed packaging that provides superior protection for medical devices and pharmaceuticals, is a finalist for the Entrepreneur of the Year® 2018 Award in the New England program. The awards recognize entrepreneurs who are excelling in areas such as innovation, financial performance and personal commitment to their businesses and communities. Mr. Kelly was selected as a finalist by a panel of independent judges. Now in its 32nd year, the program has expanded to recognize business leaders in more than 145 cities and more than 60 countries throughout the world. Award winners will be announced at a special gala event on June 28, 2018 at the Westin Boston Waterfront. Regional award winners are eligible for consideration for the Entrepreneur of the Year National competition. Award winners in several national categories, as well as the Entrepreneur of the Year National Overall Award winner, will be announced at the Entrepreneur of the Year National Awards gala in Palm Springs, California, on November 10, 2018. The awards are the culminating event of the Strategic Growth Forum®, the nation’s most prestigious gathering of high-growth, market-leading companies. In the New England region, gold sponsors also include Boston Private Bank, fama PR, the Isenberg School of Management at the University of Massachusetts Amherst, Nixon Peabody, True Search, and Woodruff Sawyer. New England silver sponsors include Chatham Financial, Empire Valuation Consultants, Morgan Lewis, Sullivan & Worcester, and T3 Advisors. With facilities in Cranston, RI; Phoenix, AZ: Whitehall, PA; Liberty, NC; Venray, the Netherlands; Galway, Ireland; Juncos & Humacao, Puerto Rico; and San Jose, Costa Rica, Nelipak® Healthcare Packaging designs, develops and manufactures custom thermoformed packaging products that provide superior protection for medical devices and pharmaceuticals. The company offers medical trays and blisters, surgical procedure trays, pharmaceutical handling trays, custom built sealing machines and other value-added services. Nelipak’s customers consist of some of the largest and most reputable medical device and pharmaceutical companies in the world. Nelipak is focused on delivering superior quality and customer experience through world class manufacturing at each of its locations. More information about Nelipak can be found at www.nelipak.com. Nelipak® Healthcare Packaging is a trade name of Nelipak® Corporation. WHAT: At MD&M East, Nelipak will be available in booth #1657 to discuss how the company’s innovative design, development and manufacturing capabilities can be applied to today’s packaging challenges to create optimized custom solutions that are ideal for even the most stringent healthcare environments. Nelipak’s in-house design, development, prototyping, manufacturing and quality teams provide turnkey solutions to help customers take packaging projects from concept to reality. The company also offers a range of custom-built sealing machines for medical device and pharmaceutical thermoformed blisters and trays, such as its new NX-B rotary tray and blister lid heat sealers. WHEN: MD&M East 2018 will take place from June 12-14, 2018. Cranston, RI, (April 16, 2018) Nelipak® Healthcare Packaging (“Nelipak”), a full-service global provider of custom thermoformed packaging that provides superior protection fo r medical devices and pharmaceuticals, announces the availability of freestanding, easy-to-operate NX-B rotary tray and blister lid heat sealers. The flexible, customizable machines meet the demands of high volume production runs or mixed short runs requiring quick turn-around of both sealing tools and machine settings. NX-B rotary tray sealers are part of Nelipak’s collection of CE marked custom made sealing machines, ideal for Class 7 cleanroom operations. Nelipak’s machines seal a variety of coated lid materials including Tyvek®, paper, film or foil and ensure validated seals when used in conjunction with the company’s matching sealing dies, blisters and tools. The NX-B machines are available in two and four station versions and are tailored to meet customers’ specific sealing needs. Other notable features include PLC controls with options for in-line lid stock pick and place, robotic handling of trays, and in-line printing of lids. Nelipak’s sealers are reliable and easy to maintain and feature quick tool change sealing dies and profiled heat plates with RFID readable tags linked to machine recipes. Nelipak has also recently enhanced its popular NX-T1 PLC Controlled Sealer, which features a touch button for “hands free” sealing. The drawer automatically closes to seal trays and returns to the open position upon completion of the seal cycle. See NX-B Rotary Sealer video. See NX-T1 Table Top Sealer video. Nelipak will be in booth 10H10 at Medtec Europe from April 17-19, 2018. With facilities in Cranston, RI; Phoenix, AZ: Whitehall, PA; Liberty, NC; Venray, the Netherlands; Galway, Ireland; Juncos & Humacao, Puerto Rico; and San Jose, Costa Rica, Nelipak® Healthcare Packaging designs, develops and manufactures custom thermoformed packaging products that provide superior protection for medical devices and pharmaceuticals. The company offers medical trays and blisters, surgical procedure trays, pharmaceutical handling trays, custom built sealing machines and other value added services. Nelipak’s customers consist of some of the largest and most reputable medical device and pharmaceutical companies in the world. Nelipak is focused on delivering superior quality and customer experience through world class manufacturing at each of its locations. More information about Nelipak can be found at www.nelipak.com. Last week, the Nelipak team took some time out from our global sales meeting in Phoenix, AZ, to participate in an event for Native Health, which provides holistic, patient-centered, culturally sensitive health and wellness services to Native American families in the Phoenix area. Approximately one in seven families currently struggle to put enough food on the table and are reliant for support in the form of box packs from Native Health. Our team values the opportunity to help give back to the community and was pleased to be able to help Native Health put together sponsored food packs with essentials to feed over 200 people. WHO: Nelipak® Healthcare Packaging (“Nelipak”), a full-service global provider of custom thermoformed packaging that provides superior protection for medical devices and pharmaceuticals. Nelipak is a member of the Sterile Barrier Association and the Healthcare Plastics Recycling Council. WHAT: In Booth 43 at HealthPack 2018, Nelipak will be highlighting how it uniquely combines freehand design capabilities with advanced technology and manufacturing services in order to develop custom medical packaging optimized for its customers’ purposes. Nelipak will also be sponsoring the breakfast session on Wednesday, March 7th from 7:00- 8:15 a.m.
WHAT: Nelipak Healthcare Packaging will be demonstrating a new way to utilize collaborative robotic technology in conjunction with its NX-T1 cleanroom heat tray sealer to optimize process automation. At booth 1970, Rethink Robotics’ Sawyer robot will work with Nelipak’s NX-T1 to demonstrate high-performance automation by collaboratively working with operators handling medical device and pharmaceutical packaging. 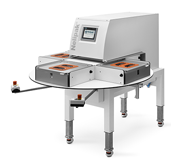 Designed and built by Nelipak, its range of custom built sealing machines are ideal for Class 7 cleanroom use for medical device and pharmaceutical applications. Easy to operate with low maintenance requirements, these high performance tray and blister lid sealers come with a range of options to suit any manufacturing need. Incorporating robots in the manufacturing process can help reduce human error and improve quality for increased patient safety. Rethink Robotics’ Sawyer robot is designed to work safely in collaboration with humans, and is the easiest train – fastest to-deploy robot on the market. Sawyer’s adaptable automation also allows manufacturers to adjust to constant change, including short production runs, quick changes and modifications, seasonality and ebbs and flows in demand. The NX-T1 tray sealer is highly complementary to Nelipak’s design, development and manufacturing capabilities. At MD&M West, Nelipak will also highlight how these innovative capabilities can be applied to today’s packaging challenges to create optimized custom solutions that are ideal for even the most stringent healthcare environments. WHEN: MD&M West 2018 will take place from February 6-8, 2018.